After years of planning, officials at the federal government’s 401(k)-style retirement savings plan are finally ready to provide an employer contribution to members of the military. The blended retirement system is scheduled to go live Jan. 1. 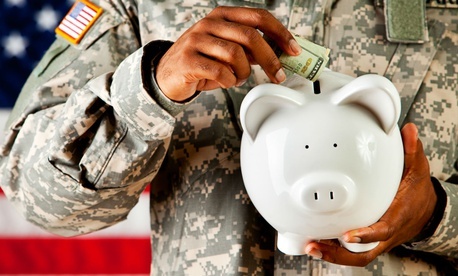 The program, which automatically enrolls all new service members and offers a one-year opt-in period for current military personnel, provides an employer match of between 1 percent and 5 percent to the Thrift Savings Plan in exchange for a less generous annuity calculation if they stay the full 20 years required to earn pension benefits. At a meeting of the TSP’s governing board Monday, project manager Tanner Nohe said all is in place for the new system to go live on New Year’s Day. Nohe said officials have successfully run tests to process payroll submissions from each of the armed services, and he said he is confident the roll-out will go off smoothly when the first payroll reports come in on Feb. 1. On Capitol Hill, lawmakers still have not come to an agreement about how to fund the federal government, despite a looming Friday deadline to avert a government shutdown. If brinkmanship persists, here is what federal employees can expect in the realm of pay and benefits, based on guidance from the Office of Personnel Management issued in 2015. Agencies are required to pay the salaries of employees deemed essential or exempt from the shutdown, but those paychecks will not be issued until after the government reopens. On the other hand, furloughed employees have no guarantee they will be compensated for the period during the shutdown, but Congress traditionally has issued back pay after reaching a funding agreement. Sen. Ben Cardin, D-Md., and Reps. Don Beyer, D-Va., and Rob Wittman, R-Va., have introduced legislation in both chambers of Congress to ensure all federal workers are paid swiftly in the event of a shutdown. Agencies may award performance bonuses during a shutdown, but those payments won’t be made until after the government reopens. Workers who are furloughed are eligible for unemployment compensation in some states. But after the 2013 shutdown, many feds were required to return the money once Congress approved back pay. Health benefits are slightly more complicated. Furloughed employees will maintain their health insurance coverage through the Federal Employees Health Benefits Program during a shutdown. While regular premiums accrue normally and are taken out of employees’ first post-shutdown paycheck, in the case of the Federal Employees Dental and Vision Insurance Programs, if employees are furloughed for two consecutive pay periods, they will be billed via mail to maintain coverage. Retirees in the Civil Service Retirement System and the Federal Employees Retirement System will continue to receive their benefits during a shutdown. But current feds enrolled in the TSP will not contribute to their accounts or receive an employer match until after the government reopens. Feds cannot substitute paid leave in place of furloughs if the government is closed, and in the case of a shutdown, any already scheduled leave or sick days will be canceled. While the Trump administration continues its court fight to prevent transgender people from joining the military, the Defense Department issued guidance to its recruiting commands on how to process transgender recruits beginning on Jan. 1. The Washington Examiner published a copy of the document Wednesday, which includes guidelines for medical exams, pronoun usage and other issues. Officials instructed recruiters to conduct all processing based on the applicant’s preferred gender, and said applicants must be addressed using their preferred name and pronoun. A ruling on the Trump administration’s request not to allow transgender recruits is expected from a federal appeals court in the coming days.